What's the best part of moving away from home? Creating a new family!...What's the worst part? COOKING!! DE-LICIOUS. Check out this simple recipe below and let me know what you all think! I kind of free handed this recipe so apologies on not having the exact measurements. But again, this dish is super easy and it's pretty hard to mess it up. 2) Grab 25 - 30 plain and defrosted chicken wings. 3) Sprinkle both sides of the wings with salt and pepper. 4) Line baking pan with foil (or buy a disposable pan). 5) Pour 30 oz of Wish Bone Italian dressing and 20 oz of Teriyaki sauce into pan. 6) Add brown sugar and keep stirring until fully disintegrated. 7) Place chicken wings into pan and cover with foil. Place pan into oven and cook for 1 hr. During this time, the chicken will slowly cook while being marinated. 8) Take the pan out and flip chicken wings. Place back into oven and cook for an additional hour. Side Note: I served this meal with a light salad. 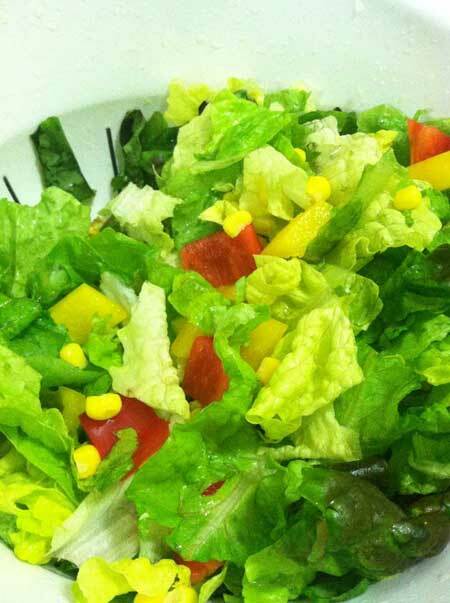 Salad consisted of: gourmet medley leaves, chopped red and yellow peppers and corn. Since corn is very flavorful and sweet, this recipe doesn't need salad dressing. 9) After the last hour, remove pan from oven and serve the wings with salad (or rice) and enjoy! !